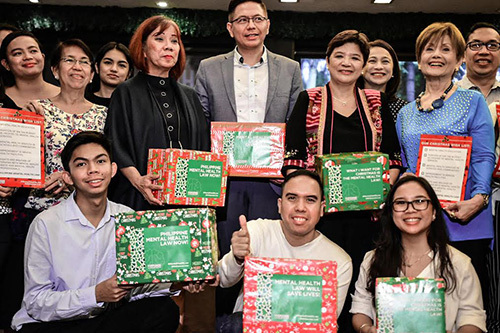 Mental health professionals, family support groups, youth and advocates on Monday gathered to show support for the Philippine Mental Health Bill, urging the House of Representatives for its final approval of what they call “a Christmas gift to the Filipino family”. In a press conference in Quezon City, a gathering of advocates called the Mental Health Alliance [MHA] in support of the said bill underscored the importance of integrating mental health in the country’s public healthcare system. House Bill No. 6452 or the Comprehensive Mental Health Act was approved on second reading last month by the House of Representatives. It will be up for third and final reading once Session resumes in November. “Health is essential to development and there is no health without mental health”, said Dr. June Lopez of the Philippine Psychiatric Association [PPA]. “The passage of the Bill into law will seal the government’s commitment to promote mental health services to Filipinos who need it,” Dr. Lopez added. According to data provided by the Department of Health and the World Health Organization, 7 Filipinos commit suicide every day and 1 in 5 Filipino adults suffer from a certain mental health concern, the most common of which are depression and schizophrenia. “This is a cause for alarm and should be addressed urgently”, said Dr. Lopez. Dr. Lopez pointed out that both the Senate and House Bill recognize the importance of preventive and community based programs. “With the passage of the Bill, we can foresee the offering of programs that enhance the resilience of individuals, families and communities.” Dr. Bautista added. “Namamasko po kami sa liderato at mga miyembro ng Kamara de Representante”, urged Dr. Bolet Bautista of the Psychological Association of the Philippines [PAP]. Early this year, the Senate approved on third and final reading its own version of the bill. Once the House of Representatives approves the said bill on third and final reading, it will be finalized by a bicameral conference committee and transmitted to the President for signing into law. “The ball now rests with the House leadership so we would like to respectfully ask our Representatives in Congress to heed our call: the Philippine Mental Health Bill is long overdue”, Dr. Bautista added. The Youth for Mental Health Coalition [Y4MH], for its part, claimed that the bill enjoys a wide support base. “The issue of mental health has long been discussed in hushed voices. But nowadays, we feel a change in the public’s mood”, claimed Y4MH’s Patrick Wincy Reyes, a student leader. “The passage of this bill into law will be celebrated by everyone, young and old. The commitment of the House leadership to this bill will be a victory for the 17th Congress”, Reyes added. “The Mental Health Bill is not only for those with diagnosable mental health conditions. Rather, it is for all Filipinos. Its provisions target the protection and promotion of well-being and mental health of every Filipino”, Dr. Bautista pointed out. This means there will be mental health services that will provide support to Filipinos undergoing challenging experiences like migration, marital conflict, life transitions, disaster experience, and war to name a few of such concerns. In relation to this, the group pointed out that mental health concerns arising out of the experience of armed conflict, such as in war-torn Marawi, are also addressed by the Mental Health Bill. “Those who have gone through war experience much suffering, which could include a sense of being unmoored and hopeless”, said Dr. Bautista. She explained that psychosocial support provided to survivors of major crisis, such as the war in Marawi, will moderate stress reactions, prevent the development of more long lasting disturbing emotional problems, and help promote not just a sense of normalcy but hope and recovery. “Such support must reach civilian individuals and families as well as the soldiers who risk their lives and wellbeing in going to battle”, she furthered. “All Filipinos are entitled to mental health, good relationships, and a life that offers many opportunities to thrive” Dr. Bautista concluded. This entry was posted in Advocacy, Health, Press release and tagged House Bill No. 6452, mental health, mental health alliance, mental health law on November 11, 2017 by Mommy Yam.